The Korea Times featured this story on the opening of Korean Culture School for Fall 2017. Here is the English translation. ASIA Families (Executive Director Grace Song) began its first fall session for Korean Culture School on the 16th. 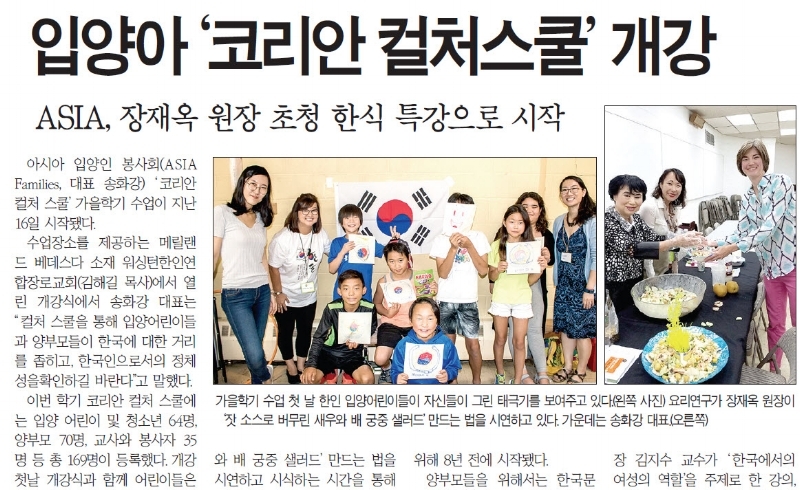 During the Opening Ceremony, which took place in United Korean Presbyterian Church (Pastor Haegil Kim) in Bethesda, MD, Grace Song stated she hopes that adopted children and their adoptive families learn more about Korea and instill Korean identity among themselves through Korean Culture School. This semester, a total of 169 people are participating: 64 adopted children and teens, 70 adoptive parents, and 35 volunteers. Following the Opening Ceremony, children learned about the Taegeukgi (Korean Flag) and drew it. The author of Vignette of Korean Cooking, Jae-Ok Chang (Cuisine researcher), demonstrated how to cook shrimp with pine nut sauce and Korean pear salad to the adoptive parents and received favorable comments. Korean Culture School assigns children to different classes according to their ages and introduces Korean culture through Hangul, songs, crafts, and games. ASIA Families started 8 years ago to support Korean adoptees and their adoptive families. For the adoptive parents, guest lectures will be given by experts in Korean culture and adoption: Mintaro Oba’s lecture about issues in North Korea in October, Professor Jisu Kim’s lecture (Director of Korean Studies at George Washington University) about women’s role in Korea in November, and an adoption expert’s lecture in December.